Wood heating remains a popular way to heat homes. Therefore, an important and the problems that arise when the output of the furnaces out of action. For example, from time to time on the outer surface of the furnace have cracks that need something to cover up. - special heat-resistant blend from the store. Even the best heat-resistant compositions that are purchased in stores may not protect against the appearance of new cracks. It's not the material used for glossing over cracks, and in the way it is done. One of the reasons of occurrence of cracks immediately after the putty dries, is the too hasty execution of works without compliance with some rules. To heat the oven before you begin work. Crack wet with water, otherwise the clutch will take away all liquid from the solution, and he will not be able to gain good strength. Do not rush after work to immediately fill the oven – first you have to wait until the putty completely dries up. A careful observance of these rules, new cracks will appear soon or will not arise at all. Consult a salesperson at the hardware store – they can tell you what mixture is best to use. If the appearance of the furnace for you, not fundamentally important, for example, when talking about the country, you can even use natural materials. The most well-known putty for oven popular recipe is a solution of a mixture of clay and sand. You can add lime or asbestos, and some craftsmen add salt. But it is better to use the classical composition of putty. Soak the clay in warm water for about twelve hours. After getting wet, mix with your hands or a shovel, depending on the upcoming amount. Lumps need to knead, and then add in the clay, the sand and stir until smooth. Its consistency should be like thick cream. The prepared solution cover with plastic and let sit in a container for about half a day. When the mixture rises, stir it again. To check the quality of the putty, roll from her piece in the palm of your hand – if it is cracked, the liquid should be added. 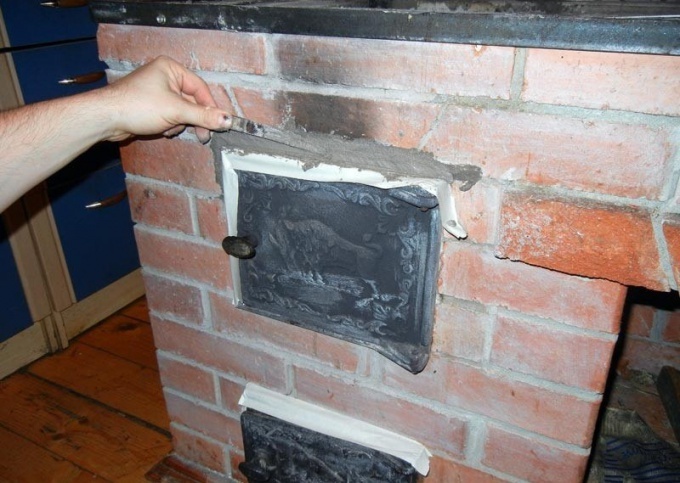 To cover the oven you can just hand – a solution of natural ingredients will not bring about skin damage. If you are using a mixture of factory production, it is possible for a hand to wear the glove and then follow the same steps. Oven to heat slightly. Dampen the crack with water, a small lump of mortar push a little slit and smear the rest over the surface. If all the stages work correctly, you can forget about the cracks. Choose to prepare putty clay without any additives. After soaking the clay must be plastic and homogeneous. Composition for glossing over cook the amount necessary for work. The proportions should be: 4 parts of clay are mixed with two parts of clean, well-sifted sand. The water may be required in different amounts depending on what the humidity of components. If you don't want to mess with the whitewash in the future, and add more lime.